Vancouver, November 8, 2018 - Fortuna Silver Mines Inc. (NYSE: FSM) (TSX: FVI) today reported net income of $6.9 million, earnings per share of 4 cents and revenue of $59.6 million in the third quarter of 2018. 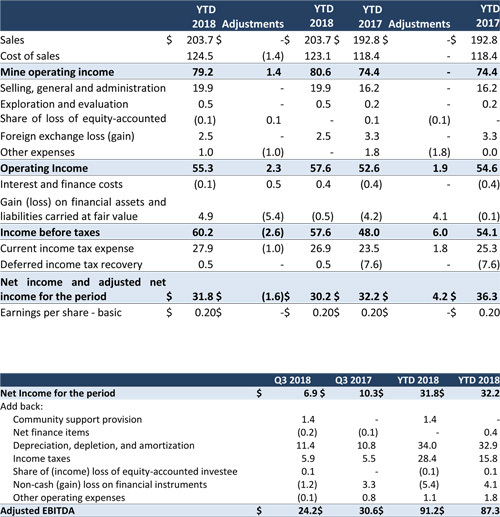 Net income for the three months ended September 30, 2018 was $6.9 million or $0.04 per share compared to $10.3 million or $0.06 per share for the comparable quarter in 2017. 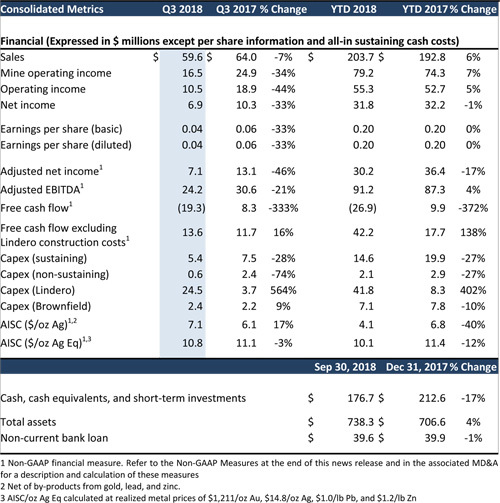 Sales for the third quarter of 2018 decreased 7% to $59.6 million compared to $64.0 million for the comparable quarter in 2017 due primarily to a decline in metal prices for silver, lead, and zinc and to a lesser extent, the timing of recognizing revenue on concentrates delivered to the warehouse prior to the end of the quarter of about $1.5 million, but which were not recognized in sales for the third quarter. 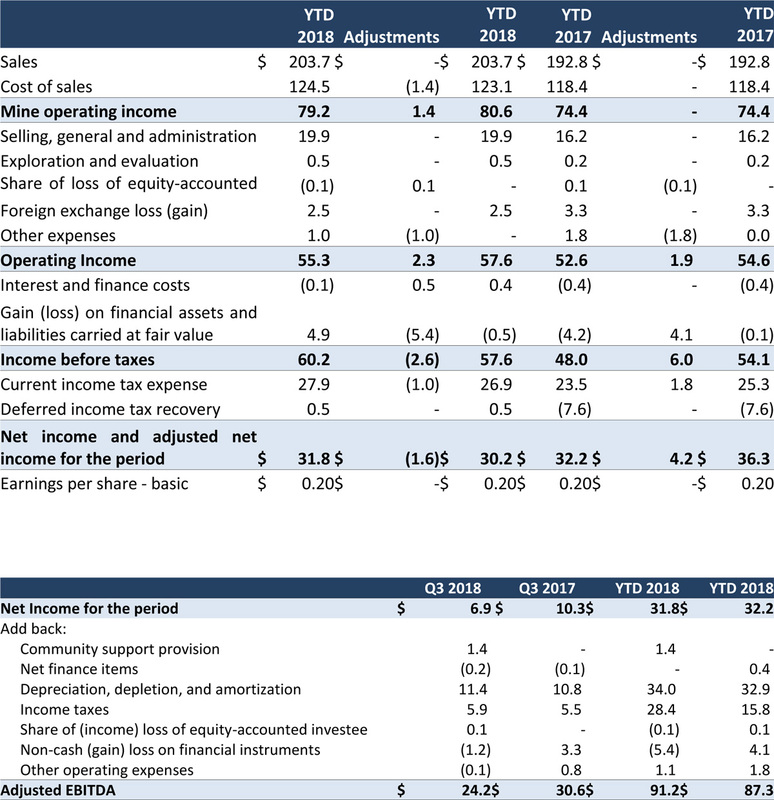 Operating income for the three months ended September 30, 2018 was $10.5 million, a 44% decrease from the $18.9 million of operating income for the comparable quarter in 2017. The key drivers for the decrease were lower sales from a decline in metal prices, higher production costs at the Caylloma mine as well as a $1.4 million provision for a community support obligation that will be paid over the next 2.5 years. 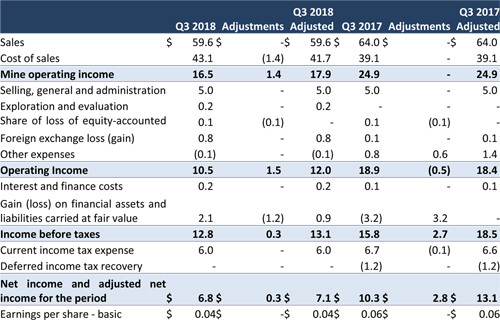 Adjusted net income decreased 46% during the quarter to $7.1 million compared to $13.1 million for 2017. 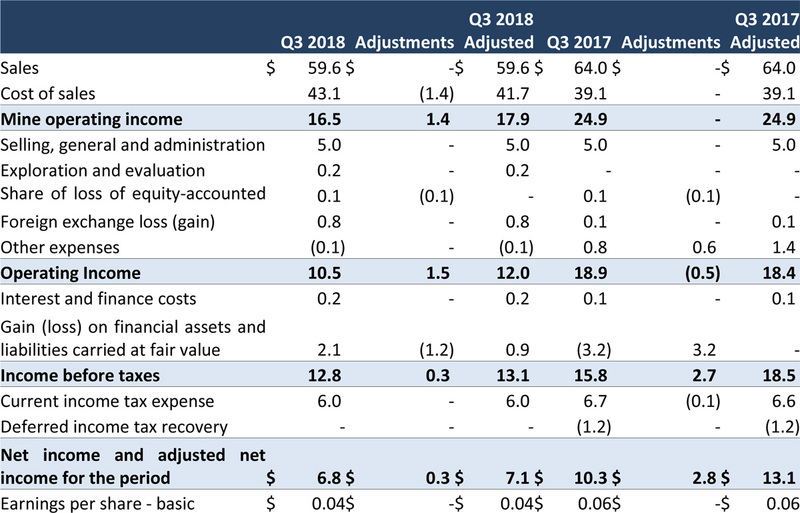 Adjusted EBITDA decreased 21% to $24.2 million compared to $30.6 million for the comparable period in 2017. Free cash flow, excluding Lindero construction costs, was $13.6 million in the quarter and $42.2 million year to date. At September 30, 2018, the Company had cash, cash equivalents and short-term investments of $176.7 million which along with our undrawn credit facility of $80.0 million will provide sufficient liquidity to meet our funding needs during the construction of the Lindero Project. 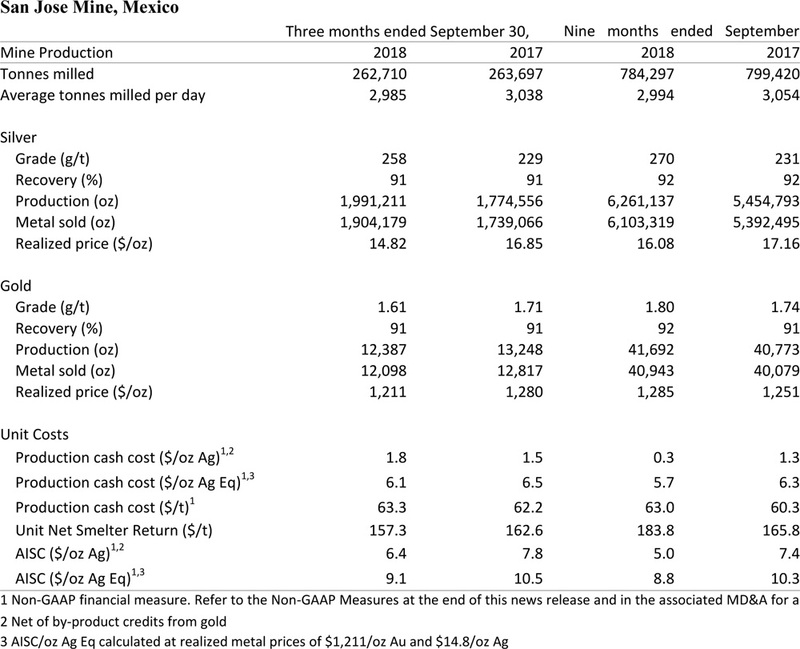 The San Jose Mine produced 1,991,211 ounces of silver, representing a 12% increase in silver production over the same period in 2017 while gold production declined 6% to 12,387 ounces compared to 13,248 ounces during the same period in 2017. 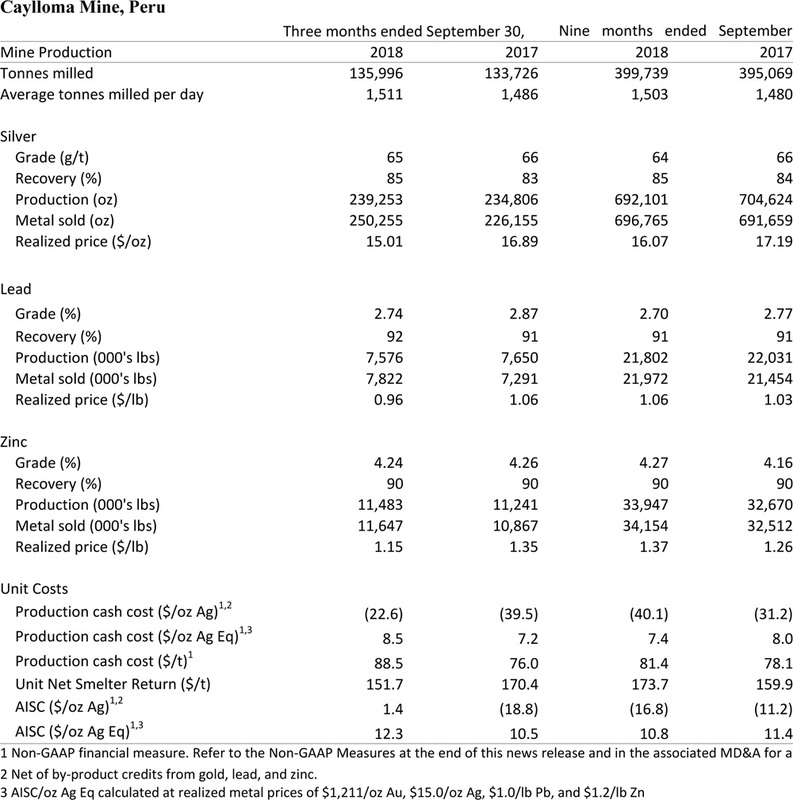 Average head grades for silver and gold were 258 g/t and 1.61 g/t which were 13% higher and 6% lower than the same period in 2017. Cash cost per tonne of processed ore increased 2% to $63.3 for the third quarter compared to $62.2 for the same quarter in 2017 due primarily to higher energy tariffs and partially offset by lower mining costs. Cash cost per for the nine months ended September 30, 2018 increased 4% to $63.0 compared to $60.3 for the comparable period in 2017 and was slightly above our annual guidance. Cash cost per tonne for the year is expected to remain within 5% of our annual guidance of $61.2. The Caylloma Mine produced 7.6 million pounds of lead and 11.5 million pounds of zinc during the third quarter of 2018 representing a 2% increase in zinc production a 1% decrease in lead production over the same period in 2017. Average head grades for lead and zinc were 2.74% and 4.24%. 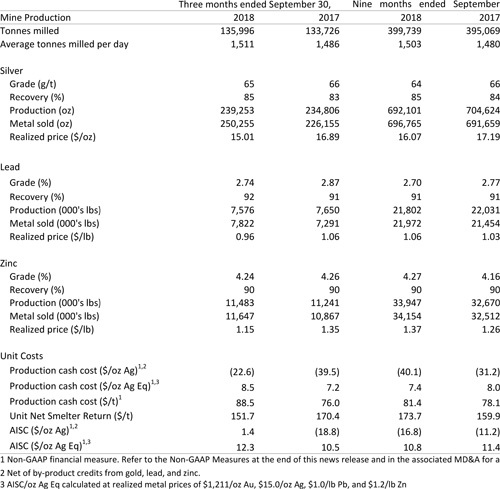 Silver production was 239,253 ounces which was 2% higher than the comparable period in 2017. Cash cost per tonne of processed ore for the third quarter of 2018 was $88.5 or 16% higher than the $76.0 cash cost for the comparable quarter in 2017. Cash cost per tonne on a year-to-date basis was $81.4 or 4% above 2017. The slightly higher cash cost for the nine months ended September 30, 2018 was due to higher labour and related personnel expenses that came into effect on August 2018. The Company expects an incremental cost of approximately $1.1 in the fourth quarter relating to a community support agreement entered into in the third quarter. Cash cost per tonne for the year is expected to be within 5% of our annual guidance of $81.3. 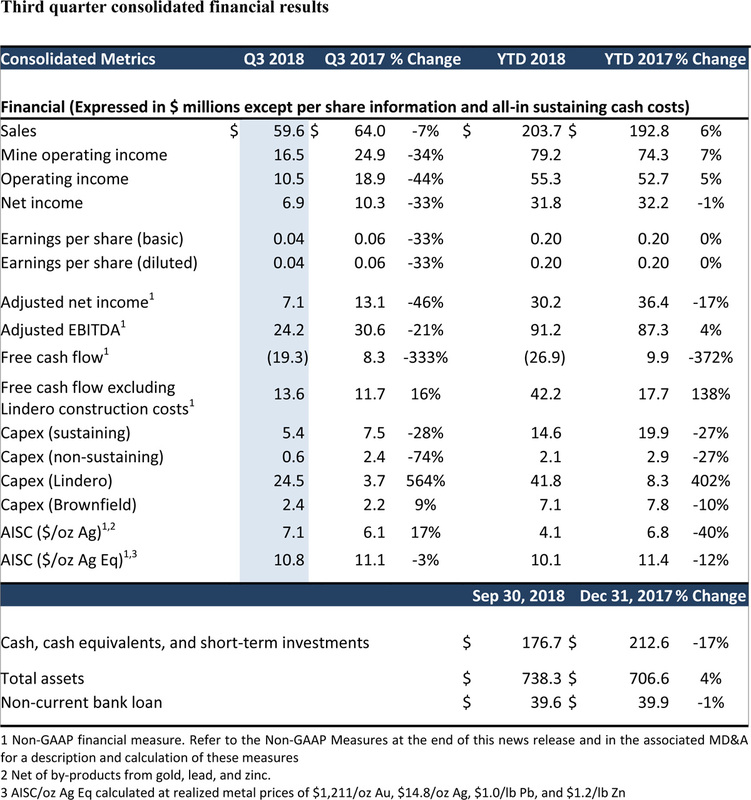 The following tables represent the computation of certain Non-GAAP Financial Measures as referenced in this news release. The financial statements and MD&A are available on SEDAR and have also been posted on the Company's website at https://www.fortunasilver.com/investors/financials/2018/. Playback of the conference call will be available until November 23, 2018 at 11:59 p.m. Eastern. Playback of the webcast will be available until November 8, 2019. In addition, a transcript of the call will be archived on the company’s website: https://www.fortunasilver.com/investors/financials/2018/. Fortuna is a growth oriented, precious metals producer with its primary assets being the Caylloma silver mine in southern Peru, the San Jose silver-gold mine in Mexico and the Lindero gold Project in Argentina. The Company is selectively pursuing acquisition opportunities throughout the Americas and in select other areas. For more information, please visit its website at www.fortunasilver.com. This news release contains forward looking statements which constitute “forward looking information” within the meaning of applicable Canadian securities legislation and “forward looking statements” within the meaning of the “safe harbor” provisions of the Private Securities Litigation Reform Act of 1995 (collectively, “Forward looking Statements”). All statements included herein, other than statements of historical fact, are Forward looking Statements and are subject to a variety of known and unknown risks and uncertainties which could cause actual events or results to differ materially from those reflected in the Forward looking Statements. The Forward looking Statements in this news release include, without limitation, statements about the Company’s plans for its mines and mineral properties; the Company’s business strategy, plans and outlook; the merit of the Company’s mines and mineral properties; the future financial or operating performance of the Company; and proposed expenditures. Often, but not always, these Forward looking Statements can be identified by the use of words such as “estimated”, “potential”, “open”, “future”, “assumed”, “projected”, “used”, “detailed”, “has been”, “gain”, “planned”, “reflecting”, “will”, “containing”, “remaining”, “to be”, or statements that events, “could” or “should” occur or be achieved and similar expressions, including negative variations. Forward looking Statements contained herein are based on the assumptions, beliefs, expectations and opinions of management, including but not limited to expectations regarding the Company’s plans for its mines and mineral properties; mine production costs; expected trends in mineral prices and currency exchange rates; the accuracy of the Company’s current mineral resource and reserve estimates; that the Company’s activities will be in accordance with the Company’s public statements and stated goals; that there will be no material adverse change affecting the Company or its properties; that all required approvals will be obtained; that there will be no significant disruptions affecting operations and such other assumptions as set out herein. Forward looking Statements are made as of the date hereof and the Company disclaims any obligation to update any Forward looking Statements, whether as a result of new information, future events or results or otherwise, except as required by law. There can be no assurance that Forward looking Statements will prove to be accurate, as actual results and future events could differ materially from those anticipated in such statements. Accordingly, investors should not place undue reliance on Forward looking Statements. 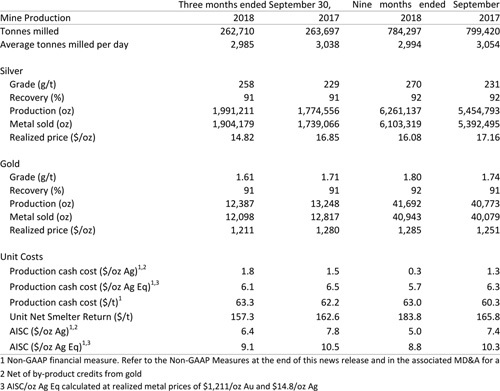 This news release also refers to non-GAAP financial measures, such as cash cost per tonne of processed ore; cash cost per payable ounce of silver; total production cost per tonne; all-in sustaining cash cost; all-in cash cost; all-in cash cost per ounce of silver equivalent production; adjusted net (loss) income; operating cash flow per share before changes in working capital; free cashflow; income taxes and interest income; and adjusted EBITDA. These measures do not have a standardized meaning or method of calculation, even though the descriptions of such measures may be similar. These performance measures have no meaning under International Financial Reporting Standards (IFRS) and therefore, amounts presented may not be comparable to similar data presented by other mining companies.